Football has dethroned “American Idol” as the most expensive TV advertising space on prime time. After five years as the priciest ad placement on TV, “American Idol” has dropped to the number two spot behind NBC’s “Sunday Night Football,” according to Advertising Age’s annual list of shows with the highest TV ad rates. Forbes.com reported on how the reality show is falling in both the ratings and ad rates. This year, the average cost of a 30-second TV commercial on the Wednesday night edition of “American Idol” has plunged by one-third to $340,825 due to the show’s declining ratings. The reality show commanded approximately $500,000 last year for a spot. This has allowed the perennially popular “Sunday Night Football” to score the top spot and top dollar from advertisers with a 30-second TV ad during a game costing $545,142. While “American Idol” may no longer lead the list of TV ad rates, the show does hold the distinction of claiming two positions on the high-priced list. In addition to the show’s Wednesday night episode claiming the second costliest spot, the Thursday night show ranks in the number five position. 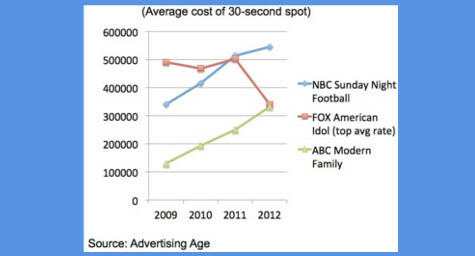 Despite its lower ratings, it looks like “American Idol” is still able to attract the audience and the ad rates. To learn more about the power of TV advertising, contact MDG Advertising today at 561-338-7797 or visit mdgadvertising.com. MDG Advertising, a full-service Florida advertising firm with offices in Boca Raton and New York, NY, specializes in developing targeted Internet marketing solutions, exceptional creative executions and solid branding and media buying strategies that give clients a competitive advantage. Our core capabilities include branding, logo design, advertising campaigns, digital marketing, print advertising, direct mail marketing, media planning and buying, radio and TV advertising, video, Web design and development, email marketing, social media marketing, and SEO.